There is a long-standing debate about whether statins have chemopreventive properties against colorectal cancer (CRC), but the results remain inconclusive. We therefore present a meta-analysis to investigate the association between statin use and risk of CRC. A comprehensive literature search was undertaken through July 2013 looking for eligible studies. Pooled relative risk (RR) estimates and 95 % confidence intervals (CIs) were used to calculate estimated effect. 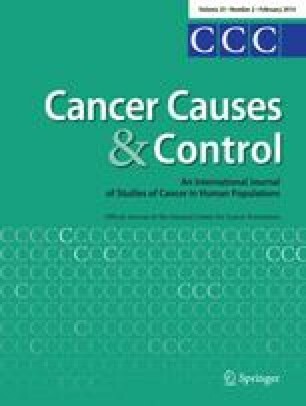 Forty-two studies [18 case–control studies, 13 cohort studies, and 11 randomized controlled trials (RCTs)] were included in this analysis. Overall, statin use was associated with a modest reduction in the risk of CRC (RR = 0.90, 95 % CI 0.86–0.95). When the analyses were stratified into subgroups, a significant decreased association of CRC risk was observed in observational studies (RR = 0.89, 95 % CI 0.84–0.95), rectal cancer (RR = 0.81, 95 % CI 0.66–0.99), and lipophilic statin (RR = 0.88, 95 % CI 0.85–0.93), but not in RCTs (RR = 0.96, 95 % CI 0.85–1.08), colon cancer, and hydrophilic statin. However, long-term statin use (≥5 years) did not significantly affect the risk of CRC (RR = 0.96, 95 % CI 0.90–1.03). Cumulative meta-analysis showed that statin use significantly reduces the risk of CRC, which has been available between 2007 and 2013. Our results suggest that statin use is associated with a modest reduced risk of CRC; apparent associations were found for lipophilic statin use. However, long-term statin use did not appear to significantly affect the risk of CRC. Yanqiong Liu and Weizhong Tang have contributed equally to this study and should be considered as co-first authors. The online version of this article (doi: 10.1007/s10552-013-0326-6) contains supplementary material, which is available to authorized users. There are no potential conflicts of interest among any of the authors.